Tropical storm Hermine brought nothing but wind this holiday weekend at the US Open, and in Monday's completion of the first round of the Junior Champions that breeze blew away a few of the favorites, with five seeds failing to advance. The day's biggest story had two chapters, with No. 3 seed and French Open girls champion Rebeka Masarova of Switzerland not showing up for her first round match today against wild card Nicole Frenkel. Fourteen-year-old Vanessa Ong, who was No. 1 on the lucky loser list, knew when main draw play began on Sunday that she might be stepping in for Masarova. "Yesterday, when I signed in for lucky loser I was told, like, the three seed hasn't shown up yet," said Ong, who went on to surprise San Diego 18s finalist Frenkel 6-3, 5-7, 6-4. "And usually when they don't check in by now, they don't come, but there was still a chance she might come, it's the US Open. I waited through the day yesterday, and I changed my flight because they said the probability of her not being here was high. And yesterday she texted one of her friends, saying she wasn't going to come. So I signed up again today and they said the probability was very high she wouldn't come, so I waited around, acting like I was going to play that match." Despite all the uncertainty, Ong played flawless tennis in the first set, while saying the breezy conditions seemed to give Frenkel more trouble. "My serve was on today," said Ong, who lives in Oklahoma City, but trains with Trent Tucker at his academy in Tulsa, Oklahoma during the week. "It hasn't been that on in a long time. I just felt great today. It was windy, so some of my balls felt off, but she looked even worse, like she couldn't handle the wind at all. So I just tried to stay solid and still aggressive, and I was on today too." Ong served for the match at 5-4 in the second set, but was broken, and lost her next service game as well. After an early break in the third set, Ong and Frenkel held serve until Ong was again serving for the match at 5-4. "In the third, when it was 5-4, I was just like, okay, don't think about the past, just think about right now," Ong said. "It's love-all and you have nothing to lose in this match, so whatever happens, just play your game." Feeling no pressure herself, Ong could empathize with Frenkel's position, who went from a underdog to a favorite when Masarova didn't show up. "I heard a lot of great things about her," Ong said of the 18-year-old, who is currently 559 in the WTA rankings. "I think [the loss] was the conditions and her nerves combined. If it was me in her position, I would have been nervous. Today, she just wasn't having a good day." 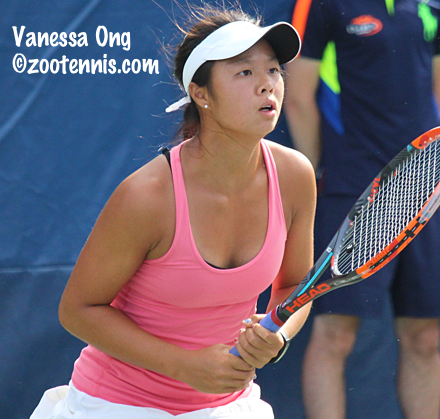 In addition to lucky loser Ong, all three of the US girls who qualified advanced to the second round. Pepperdine freshman Ashley Lahey defeated Lucia Kankova 6-3, 6-2, Kylie McKenzie downed Anastasia Zarytska of Ukraine 6-3, 6-1 and 14-year-old Hailey Baptiste closed out the singles action Monday evening with a 7-6(5), 2-6, 6-2 win over Johana Markova of the Czech Republic. The two girls seeds who lost Monday both fell to Americans, with wild card Natasha Subhash defeating No. 12 seed Katarina Zavatska of Ukraine 2-6, 6-4, 6-3 and Taylor Johnson fighting back to defeat No. 6 seed Amina Anshba of Russia 2-6, 7-5, 6-4. Johnson, down a set and a break, and then down 2-0 in the final set, was able to reverse her loss to fellow left-hander Anshba in the first round of the Grade A in Milan this spring. "I was actually up 2-0 in the third set last time," said the 16-year-old , a resident of Redondo Beach, California. "So when I got down 2-0 in the third set here, I was like, okay, it's my turn, let's go." Johnson, who is originally from Prescott, Arizona, was discovered there at age 10 by Billie Jean King, who was in town to visit her mother. After running into Johnson's father, a former professional basketball player, at the gym there, King went to the local courts and began to mentor Johnson. Johnson moved to Southern California to train with the USTA and with King's friend Rosie Casals in the area, Johnson began to work with her, which she continues to do. "I used to get really nervous when they would come and watch, but I know that they are always there for me," Johnson said. "I know, win or lose, as long as I try my best, they will be happy." Johnson played the final two games of the match, with Casals looking on, with impressive composure. She held serve at love to take a 5-4 lead over the European 18s champion, then kept the pressure on when Anshba was serving to stay in the match. Johnson just missed a lob on match point No. 1 at 30-40, then immediately got another, this time missing a sitter forehand at the net, causing the large pro-Johnson crowd gathered around Court 6 to groan in unison. Johnson took it in stride however, unwilling to feel, or show, any frustration. "I was just like, c'mon, I've got to calm down and just do this," Johnson said of her reaction to the botched forehand. I've come this far and I can do it now. I went straight to the next point, rather than dwelling on the past, I was focusing on what I could do that moment." A great return of a first serve gave Johnson a third match point and this time she converted when Anshba netted a forehand. All three seeded US girls in action today advanced, with No. 9 Usue Arconada defeating qualifier Marta Paigina of Russia 6-2, 7-5, No. 16 seed Alexandra Sanford beating Mirjam Bjorklund of Sweden 6-7(5), 6-3, 6-3 and No. 5 seed Kayla Day topping Wushuang Zheng of China 6-1, 7-5. Day, who won a round in the women's draw last week, was on Court 17, one of the biggest courts used for junior matches, but it was a far cry from playing Madison Keys on Louis Armstrong, which she did last Wednesday. "The atmosphere was just incredible the other night," said Day, who will be 17 later this month. "That's hard to beat. But it was still really fun today. There was a lot of people for juniors, and that was a good court too, so it was fun." Day had a slight hiccup against Zheng in her attempt to serve out the match at 5-4, but she broke for a 6-5 lead and converted her second match point for the win. By reaching the second round of the women's main draw, Day is entitled to $77,000 dollars for her efforts, but she can't retain her college eligibility if she accepts it. 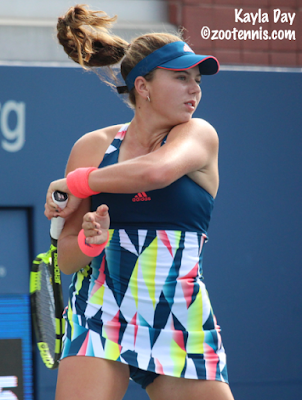 "I haven't decided yet," said Day, who, in addition to winning the USTA 18s Nationals, won two qualifying matches over WTA Top 100 players in Connecticut the week before the Open. "I'm kind of holding off as long as possible. They said I could decide by the end of juniors this week, so I'm seeing how I do this week." The US girls finished the first round 14-8, with all six seeds getting through. The US boys finished the first round 8-8, with four of those wins coming in Monday's action. Qualifiers Patrick Kypson and Alafia Ayeni won their matches, meaning all five US juniors who got through qualifying made the second round. Kypson defeated fellow qualifier Yuta Kikuchi of Japan 7-6(3), 7-5 and Ayeni beat Tung-lin Wu of Taiwan 7-6(3), 6-2. JJ Wolf defeated Italian qualifier Andrea Guerrieri 6-4, 6-1 and No. 3 seed Ulises Blanch took out former ITF World No. 1 junior Orlando Luz of Brazil 6-4, 6-4. With a tough first round draw for the second junior slam in a row, after beating former World No. 1 junior Casper Ruud of Norway at Wimbledon, Blanch could have complained about his bad luck. But after nearly a month-long illness, yet to be diagnosed, the 18-year-old was happy he felt well enough to compete in New York this week. 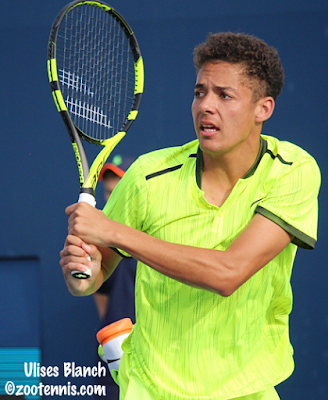 After his semifinal run at the Wimbledon Juniors, Blanch received a wild card into qualifying at the ATP event in Washington DC, but he began to feel ill as he prepared for the tournament. "I felt horrible the whole week," said Blanch, who at first thought it might just be jet lag. "I didn't know what was going on. The day of the match, I had to play, I wanted to play so badly. I played, I did what I could. I was supposed to go to a Futures after that, and then play Kalamazoo, and then go home, but I felt so bad, I told my coaches I can't." Blanch returned home, but his condition didn't improve. "I was home on the bed, I couldn't move," Blanch said. "I couldn't talk for like a week and a half because my throat was horrible swollen. I was in bed, looking at the Kalamazoo draws, wishing I was playing." Blanch said blood tests are still be evaluated, but it's believed he suffered from a virus. "I got a little bit better, but then I started having pain in my joints because I hadn't moved in so long," Blanch said. "It was kind of a struggle, I didn't practice that much going into the Grade 1 in Canada. I wasn't going to play, but I needed match play. I did what I could (he reached the semifinals) got some match rhythm, and now I'm playing a little bit better." After missing his last chance to play Kalamazoo, the 18-year-old did not want to miss his last junior slam. "I think the will to play also helped me a lot," Blanch said. "To get back on the court, to work. When I was so weak, it was horrible. But I'm better now." Of the two boys seeds to fall on Monday, one was American John McNally, who was beaten by Canada Grade 1 champion Alejandro Davidovich Fokina of Spain 3-6, 6-3, 6-3. No. 15 seed Yibing Wu of China lost to Vlad Dancu of Romania 4-6, 6-3, 6-4. Four girls and four boys first round doubles matches were played Monday, with USTA girls 18s champions Ena Shibahara and Jada Hart, who received a wild card, taking out top seeds Anastasia Potapova and Olesya Pervushina of Russia 6-4, 6-2. Only 16 of the 32 second round matches are on the schedule for Tuesday, along with the 24 remaining first round doubles matches. US boys in singles action on Tuesday are Brandon Holt, Alexandre Rotsaert, Sam Riffice and Ayeni. US girls playing second round matches Tuesday are Claire Liu, Sonya Kenin, Amanda Anisimova, Nicole Mossmer, Johnson and, playing each other, Lahey and Subhash.